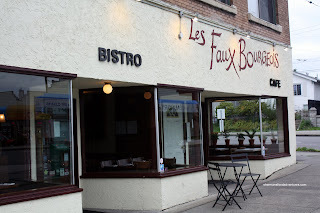 It's been over a year since we last visited Les Faux Bourgeois. 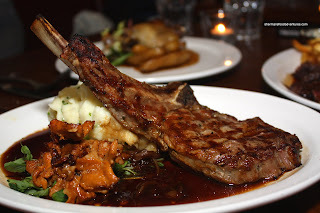 During that time, the place has emerged from being a little French bistro located in an odd location to one of Vancouver's dining destinations. 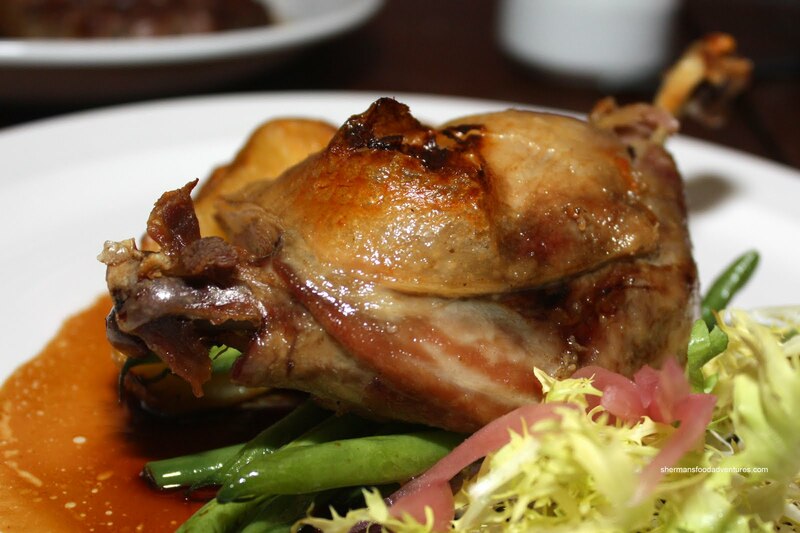 A combination of good food and reasonable prices, it is no wonder that Les Faux has claimed a spot on many top-10 lists. With so many accolades, the place is very popular and there is nearly no chance of getting a table as a walk-in. Thus, much like last year, I had to make a reservation far in advance. The main reason for the re-visit was due to Elaine's birthday. She had not tried Les Faux before and despite my hesitation to d o too many repeats, I was more than happy to oblige since I really like the place. 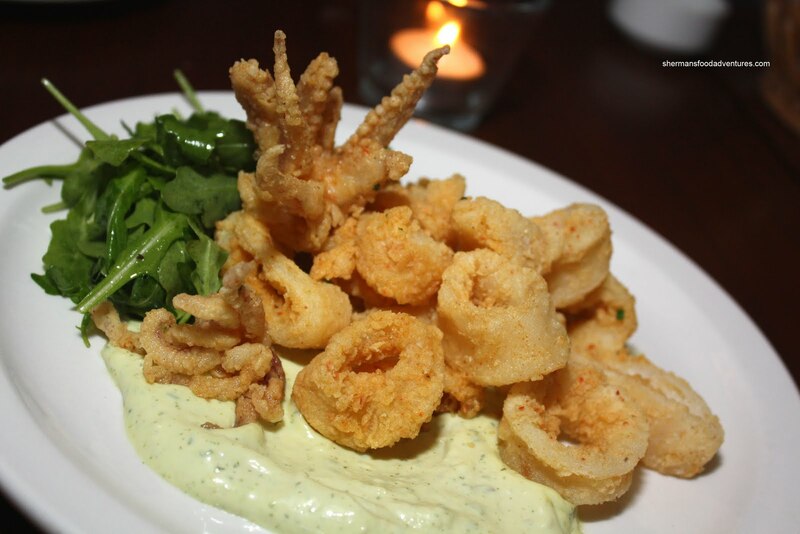 Anyways, we decided to split 3 appetizers starting with the Calamari with tarragon aioli. Sure, not really a "French" dish per se; yet it was on the daily specials and it sounded good. In reality, it was good. It was fried perfectly with a crispy, non-oily coating. The squid itself was tender while not being mushy. Although the squid was flavourful on its own, the tarragon aioli was a nice mild-tasting accent. The only thing I would've liked to see was maybe some acidity in the mayo. Although the Moules et Frites was not really an appetizer, we ordered it as such. Advertised as a spicy charred tomato & scallion broth, it was very tomatoey; but not really all that spicy. Lots of fresh chunky tomatoes provided freshness and the charring added depth. 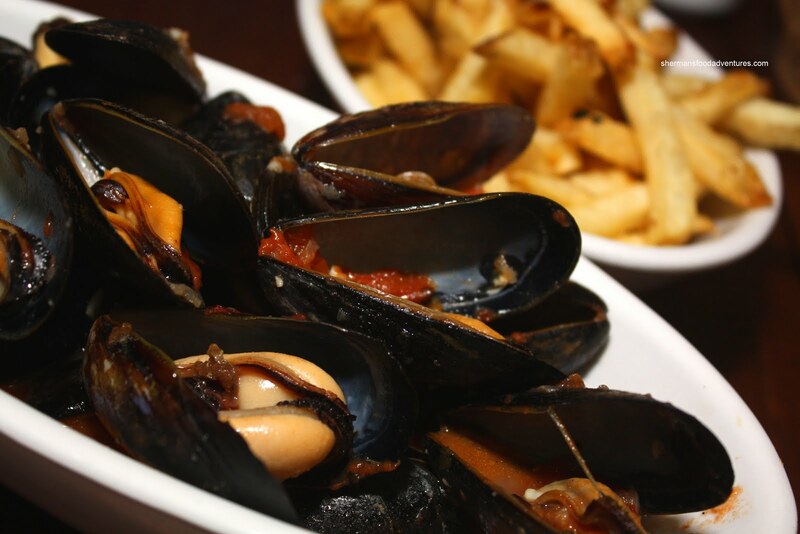 Curiously, big plump mussels were mixed in with small, emancipated ones. I guess it is the luck of the draw... The frites were pretty good. Very crisp, well-seasoned and not oily. A tad on the starchy side; but very good nonetheless. 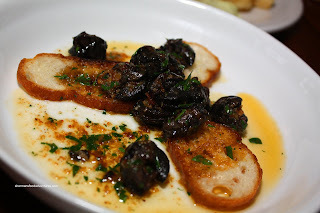 Our last appie was the classic Escargots. Served atop 3 croutons, the escargots were not very flavourful. I would go as far as calling them bland. Sure, there was enough butter and some garlic; but the whole dish seemed to be missing salt. Moreover, I found the snails themselves to be on the rubbery side. When it came time to order our mains, Elaine and Costanza took my suggestions based on my last visit. 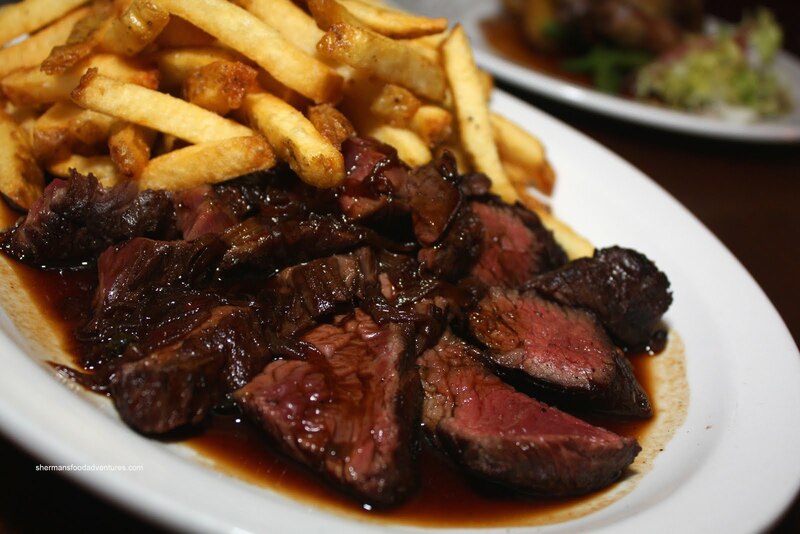 Hence, Costanza had the Steak Frites. Originally, he wanted his steak medium; but both the server and I convinced him to have it medium rare. You see, in this version, they were using a hanger steak, which is the meat directly above the diaphragm. It is very flavourful; but can be tough if overcooked. It turned out to be a good decision since it was perfect and as tender as it could be. Laced in a full-bodied and well-balanced red wine shallot jus, there was no shortage of flavour. The same wonderful frites took up the rest of the plate. Too bad Costanza had his fill from the Moules et Frites. No matter, I just ate all the frites he couldn't handle! Elaine opted for what I had last time which was the Duck Confit. In a noticeably smaller portion than last time, the confit was just as good though. Tender, well-seasoned meat with a crispy skin, this is one of my personal favourite versions of this dish in Vancouver (with Pied-à-Terre being a clos e 2nd). Viv ended up with one of the specials for the night. Good thing we had the earlier seating because the Veal Chop sold out shortly afterwards. The generous portion of veal was cooked perfectly. I found it to be tender and full of meat flavour. Accompanied by chantrelles and chive mashed potatoes, this was a hearty meal that Viv could not finish. I had the other featured item on the specials board being the Pot-au-Feu. Now, if you are totally confused why there is a chicken breast in the picture, I don't blame you. Normall y, this dish is made of beef. And honestly, I wish it were beef since the entire thing was bland. Sure, it isn't supposed to be a flavour explosion, I get that. However, a little salt would've done wonders. 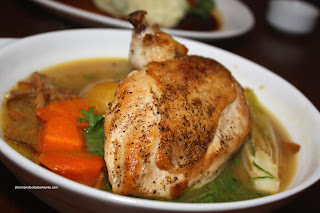 Despite this, the chicken was still decently moist for white meat. For dessert, we all shared the Vanilla Creme Brulee and Chocolate Gateau. 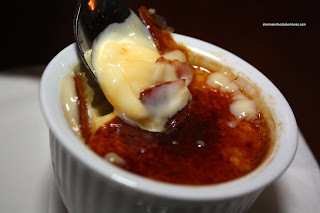 With a beautifully torched hard sugar top, it had all the earmarks of a great brulee. We found it to be a bit too sweet and the custard to be a bit thin. But overall, it was fine. As for the Chocolate Cake, it was more of a ganache than anything. 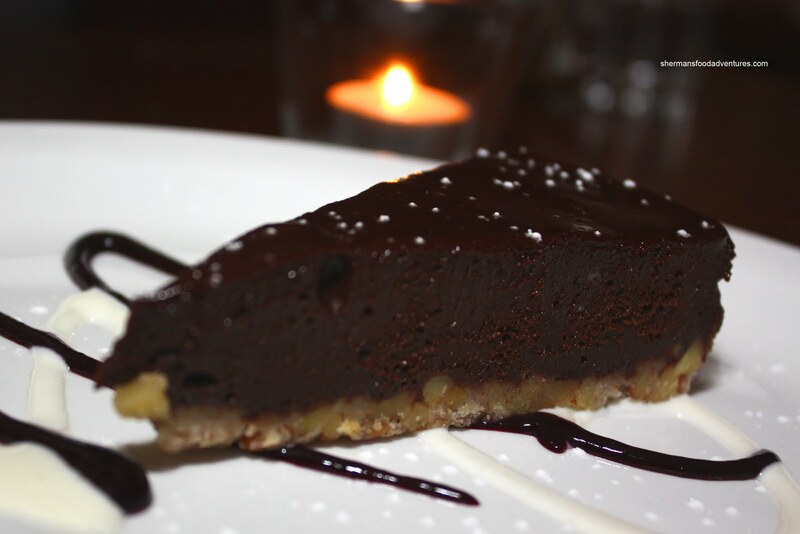 The sweetness was quite muted and the dark chocolate was able to shine with the desired bitterness. After it was all said and done, Elaine and Costanza remarked that the meal was pretty solid all around. For the prices they charge, it is no wonder Les Faux remain popular as ever. Sure, Le Croc is better; but that is really comparing apples to oranges. 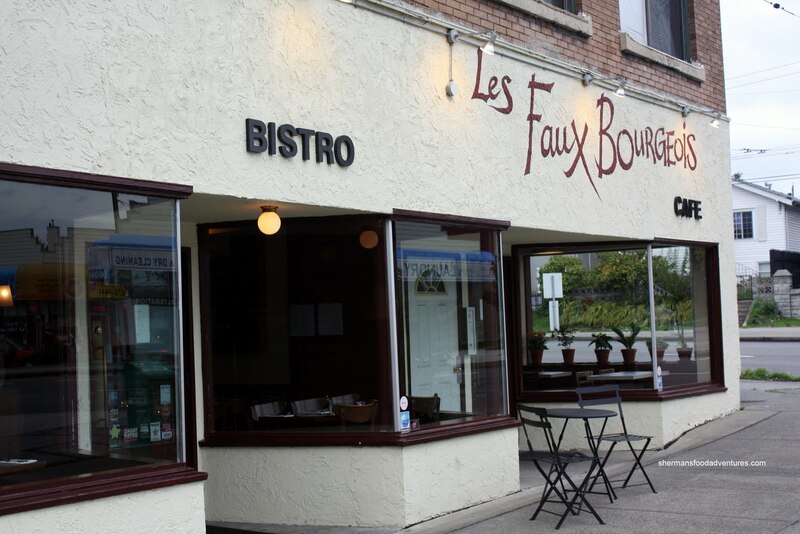 If you have a craving for French food on any ol' day, Les Faux certainly fits the bill.